If you are looking to buy property in Mijas, Costa del Sol, Spain then you will almost certainly need to find a list of Mijas real estate agents. Our list of estate agents also helps if you are looking to find properties for sale or rent, or if you are wanting to sell your own property. Examples of properties for sale in Mijas and surrounding area are at the bottom of this page. Mijas is a fantastic place to buy a property whether you want to buy a property for a holiday home or whether you intend to live in Mijas. Estate agents in Mijas operate differently as opposed to countries such as the United Kingdom. In the United Kingdom you have to trawl from one estate agent to the next and each has their own unique properties for sale. This is very time consuming. Mijas estate agents and inmobiliaria have their own unique properties for sale but they can also show you other properties on sale from other Mijas estate agents. Service. Over decades experience. Guiding through the whole process. Established in 1978, at Elite we have plenty of experience. If you want to know all about what it is like living in Mijas and the current property market, then you must read our in-depth interview with Fred van Krimpen of Elite Inmobiliaria on our main Mijas page. 3rd. There is also ‘Las Lagunas’ a more modern residential and comercial area. Offering a complete package of services related to the sale and purchase of properties along the Costa del Sol, including new developments and high quality holiday rentals. Working in collaboration with the majority of Real Estate agents from Malaga to Sotogrande, we can take care of all aspects of your journey of buying or selling a property, for personal or investment purposes. We listen to your requirements and will search the market for you, find the most suitable properties, the best deals and guide you step by step through the process in Spain. Let us take care of the addition steps you need – negotiations, contracts, advice on Residencia and Spanish legalities. If you sell your property through us, you will receive an excellent rate of commission, and we can offer personalized marketing and advertising, ensuring your property reaches the right target market. We will give you a valuation of your property based on its position, condition and current market trends, taking professional photos and videos to ensure it is shown to its full potential. All the required documentation will be checked to be in order to make the sale run as smoothly as possible. With dedicated staff and a wide range of resources we will help you with everything you need to sell or buy a property on the Costa del Sol – a reliable service with satisfaction guaranteed. Sunshine Golf Properties is located in Mijas Costa, Malaga. Specialising in property sales, Sunshine Golf Properties has been in business for over 10 years. We have extensive knowledge of Costa del Sol and the surroundings, making us the perfect company to help you purchase your dream Sunshine home. Our staff are friendly and professional and ready to find you the perfect villa or beachfront apartment. We also organise courses from Torrequebrada Golf to Real Club de Golf Sotogrande. If you want to buy a property in Mijas – the two estate agents will split the commission so the property you want to buy won’t cost you anything more. Remember to go on your instincts. Buy what YOU want to buy. Of course you should listen to advice from the Mijas estate agent, they know the local area and know the Mijas property market inside out but ultimately it is your decision on whether to buy a property. Don’t be swayed by an agent who is looking to influence you unduly in order to make the sale. Estate agents in Mijas will view a property and give a guideline at which price to market the property however ultimately the owners decide at which price to sell the property for and some unrealistically overprice their houses. Estate agents in Mijas charge different commissions, expect typically to pay between 3% and 5%. If you are looking to sell your property in Mijas then we recommend going for an estate agent with an office in a busy location. A Mijas estate agent with an office demonstrates a degree of credibility and ensures they will have passing traffic. They will naturally also have an Internet presence also. 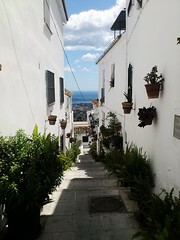 Many estate agents in Mijas will also have houses and apartments for rent in Mijas. Do consider a long term let or rental in Mijas or rent a villa or apartment in Mijas as a way to get to know the area first. Below are examples of a range of high quality apartments and villas to rent in Mijas on the Costa del Sol in the Riviera del Sol area close to all the bars, shops, restaurants, golf and beaches the area has to offer. Most Mijas estate agents should also be able to help you with these services: finding apartments for sale or rent, villas and houses for sale or rent, townhouses for sale or rent, selling your property, letting your property, information on the local area such as amenities, facilities and schools, new build properties and resales, cheap bargain properties including repossessions and distressed sales, property maintenance, valuations, luxury properties, property finding services and arranging mortgage financing, Some agents will also handle commercial property such as shops to let or lease, bars and restaurants for sale and land for sale. Estate Agents in Mijas – Page Summary – This page contains unique content about estate agents (known in Spain as inmobiliaria) in Mijas as well as a directory of known estate agents in order to help people looking to let or buy property in the Mijas area.